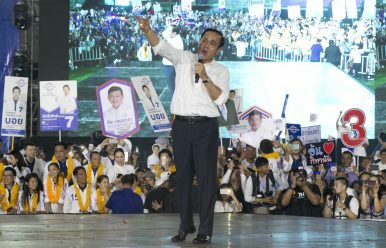 Thai Prime Minister Prayut Chan-o-cha of the Palang Pracharat Party delivers a speech to supporters in Bangkok, Thailand, March 22, 2019. More than 70 parties are contesting Sunday’s general election in Thailand, the first since a military coup nearly five years ago. Up for grabs are 500 seats in the House of Representatives, where parties will need to win at least 25 seats to be able to nominate their preferred candidate for prime minister. The prime minister will be chosen in a joint vote of members of the elected house and the unelected senate, whose 250 members will all be appointed by the junta after the general election. Size, past performance, and buzz suggest just a handful of parties will win enough seats to nominate a candidate. Here are the leading contenders days before the polls. The current prime minister has the inside track to keep his post. Prayut, 65, was a career soldier who made it to the pinnacle of his military career in 2010, when he was appointed army commander in chief. The job put him in a pivotal position during the long-running and sometimes violent struggle for power between supporters and opponents of former Prime Minister Thaksin Shinawatra, who was toppled in a 2006 military coup. Prayut went on to lead his own putsch, the May 2014 coup against a government established by Thaksin’s sister. Taking over as junta chief and prime minister, and wielding absolute power he granted himself, Prayut cracked down on dissent and moved to prevent a comeback by Thaksin’s political machine, primarily by pushing through a new constitution that weakens political parties. In the past year, Prayut has made himself over as a politician. But his gruff manner, sharp tongue, and short temper raise doubts about his ability to work smoothly within a more democratic framework. Prayut is the candidate of the Palang Pracharath Party, considered a proxy for the junta’s interests. His biggest advantage is the bloc support most expect he will get from the Senate, which he will have appointed. Sudarat, 57, is the latest stand-in to head a party backed by Thaksin, who lives in exile abroad to avoid a jail sentence but is still a key political player. The daughter of a former member of parliament from the country’s northeast, she was educated at Bangkok’s top schools. She entered politics in 1991, winning a house seat in Bangkok for the reformist Palang Dharma Party, which was also billionaire businessman Thaksin’s entryway into politics. In 1994 she became deputy transport minister in a Democrat Party-led coalition government. In 1998, she helped Thaksin found his Thai Rak Thai Party, in which she became deputy leader. When Thaksin led his party to victory in 2001, she was appointed public health minister, and in 2006 she became agriculture minister. After the coup, she was one of 111 Thai Rak Thai party executives banned from politics for five years when a court disbanded the party for breaking election laws. Sudarat’s big advantage is that she is the candidate for Thaksin’s flagship Pheu Thai Party — and Thaksin’s parties have won every national election since 2001. Abhisit, 54, is a former prime minister whose fate has been intertwined with the country’s political upheaval. Born in England and educated at Eton and Oxford, he joined the country’s oldest party, the Democrats, in 1992 and assumed the party leadership in 2005. The Democrats, popular in Bangkok and their southern political strongholds, have been the main opposition party to those of Thaksin. They haven’t been able to achieve nationwide electoral success in some time, and rather than compete against Thaksin at the ballot box, the party over the past 13 years has twice chosen to boycott elections. Abhisit was, however, able to climb to the premiership in a 2008 parliamentary vote that followed another court decision to disband a Thaksin-backed ruling party. His time in office is most remembered for 2010 street protests in which Thaksin’s supporters occupied central Bangkok as they demanded new elections. Over several weeks, increasing violence engulfed the protests as the authorities tried to rein them in. Finally, the army launched a full-scale armed assault to end the demonstrations. The episode left 91 people dead and more than 2,000 hurt, most of them civilians. Abhisit and the Democrats lost the next election in landslide to Thaksin’s Pheu Thai. Abhisit has tried to position himself as a potential compromise prime minister for those who don’t want a continuation of army-aligned rule or to see another Thaksin-backed party in power. Anutin, 52, is the least ideological of the major candidates, heading a party that is a regional powerhouse in the rural northeast and known for cutting deals with parties on both side of the political divide. He is heir to a major construction company fortune, and follows in his father’s footsteps in having a hand in both the business and political worlds. The family conglomerate, Sino-Thai Engineering and Construction PCL, has a long history of contracts for government mega-projects such as Bangkok’s Suvarnabhumi Airport. He holds an engineering degree from Hofstra University in the United States. Bhumjai Thai is an offshoot of a former Thaksin-backed party formed by a faction of politicians whose shift in allegiances during political unrest in 2008 allowed Abhisit to become prime minister. The party gain nationwide appeal by championing liberalization of marijuana laws, clear legalization of ride-sharing services and the easing of repayment terms for student loans. The party placed third in the last election in 2011, but its place at the center of past political deals makes Anutin a dark horse candidate. Thanathorn, 40, heads a party established last year that has positioned itself as a choice for progressive opponents of military rule. Thanathorn is a wealthy businessman who was born and raised in Bangkok. Before entering politics, he ran his family’s auto parts manufacturing business. Most of Future Forward’s leadership, tapped in large part from the NGO community, is in their 20s and 30s, which has earned the party a large following of young voters. The party’s inexperience and fairly narrow base mean it may not win enough seats to nominate Thanathorn for prime minister, but it could certainly boost any coalition that strives to block Prayut. By The Associated Press, with additional reporting by The Diplomat.